Left: Brandon Opalka, “The Inexplicable Universe,” told by Jay Dude, 2014, Video still. Right: Hugo Montoya: Installation View. Courtesy of Emerson Dorsch. Walking into the Emerson Dorsch gallery in Wynwood Miami, one is faced with two opposing worlds created by artists Brandon Opalka and Hugo Montoya. Brandon Opalka is a Virginia native who was raised in sunny South Florida. He is a self-taught artist who began his career with graffiti and street art . The Â Emerson Dorsch gallery describes his work best as â€œassemblage and installation, from which emanate discrete sculptures and paintings.â€ Opalka has exhibited work in Miami, New York, Japan, and France. Hugo Montoya was born in Gainesville, Florida and received a BFA from Florida International University. Montoya has shown work throughout Miami. He specializes in installations, sculptures, and photographs. The two artists have come together to create an exhibition revolving around the common personal struggle of searching for the meaning of life (or lack thereof). Their exhibition tells â€œa story that is not meant to be understood â€” there are only varying levels of humor.â€2 At the front lobby of the gallery we are faced with our first work by Brandon Opalka called â€œWaxy Pollock (a)â€ displayed next to a rack of t-shirts on sale for forty dollars each. The painting is 81 x 61 inches and made entirely of melted wax in organic formations. Opalka purposely uses what he considers a heaven and earth tone color palette. To the right there is a space dedicated to Opalkaâ€™s paintings, installations, and video works. Brandon Opalka: Installation View. Courtesy of Emerson Dorsch. One enters Opalkaâ€™s intimate environment resembling a living room or cozy area of a home. The lights are dimmed with an inviting couch and ottoman covered in intergalactic upholstery in the center of the room to activate the space. The couch and ottoman face a television on the wall that plays a thirty-four minute video loop of â€œThe Inexplicable Universeâ€ narrated by Jay Dude. The video is both intriguing and laughable due to the demeanor of Jay Dude. He is a hefty man painted with body clay and wearing palm fronds as clothing to mimic a primitive man. He recites â€œThe Inexplicable Universeâ€ straight from cue cards showing little understanding of the words written on the cards. 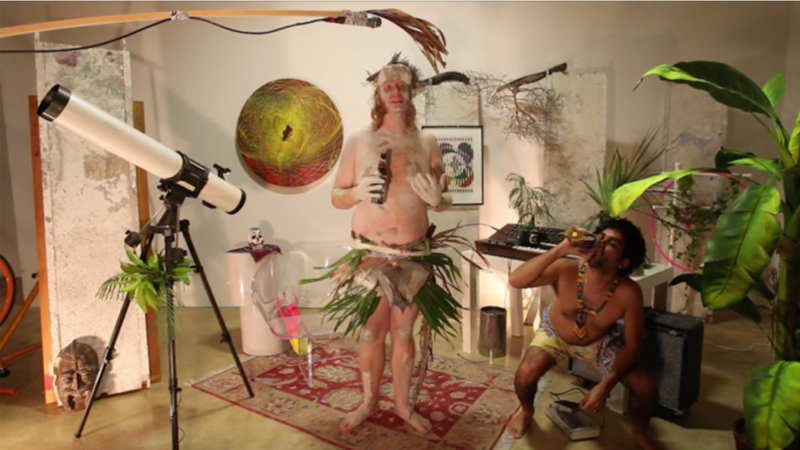 Brandon Opalka: “The Inexplicable Universe, told by Jay Dude,” 2014, video still, 34 minutes. Courtesy of Emerson Dorsch. Behind the couch the viewer is encouraged to enter Opalkaâ€™s â€œCave of Forgotten Dreams,â€ which is a separate entranceway into Hugo Montoyaâ€™s space. The dark tunnel is lined with plexiglass flooring, a foam roof, and found native foliage. In the middle of the tunnel, the participant encounters a television and synthesizer from which emanates a pulsing sound. On the television, one can see a seascape of Miami waters from the perspective of the tip of a boat. This seems like a wormhole or alternate universe where we view an ideal location surrounded by water. Crawling past this area and further down the tunnel we see a bright light leading to the next room. Directly adjacent to the tunnel exit the viewer is overwhelmed with a large-scale 125 x 75 inch poster of a child wearing headgear. The child in question is actually Hugo Montoya. According to the gallery director, Montoyaâ€™s friends had stolen the picture and redistributed it amongst their group. In response, Montoya decided to find the negative of the photo and re-purpose it for his exhibition. It is a statement about our digital information culture and the difficulty of deleting or destroying anything that has been posted to cyberspace. Once something is posted in social media, the only way to reclaim it is to redefine it. Hugo Montoya: Installation View. Courtesy of Emerson Dorsch. The lighting in this room is much brighter than that in Opalkaâ€™s space. Each object is individually illuminated to show opulence and humor all at once. The majority of the room is taken up by a plinth called, â€œWhatever you want to call it, inspired by works of art (seamless psych wall, quarter pipe),â€ displaying two works. 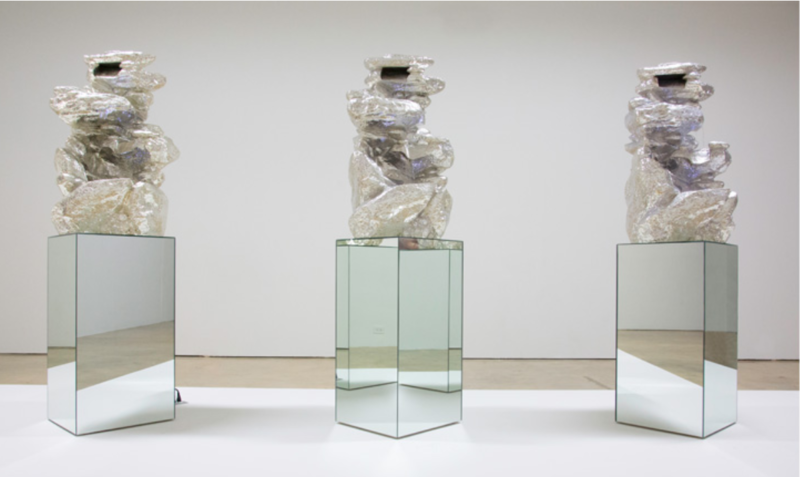 The first, â€œWork of Art,â€ presents chrome fountains on mirrored glass pedestals. The second, â€œIâ€™m rotting, eat me,â€ contains a glass tabletop supported by Goya black bean cans. Atop the horizontal glass is a chrome banana holder with bananas that read â€œFucking Hugo Montoya,â€ â€œThe Truth Will Set You Free,â€ and â€œDonâ€™t Stop the Hustleâ€¦.â€ Montoya uses many man-made materials and displays them in such a dramatic fashion that one cannot help but find the piece satirical. The ramp he used to display the works is inspired by the marketplace now and how one cannot just simply take a picture of something on a table, but must go to elaborate lengths to sell an object. The Goya beans were a nice local Miami touch as the Spanish brand â€œGoyaâ€ makes a stronger connection to Miamiâ€™s Hispanic community than an American brand like â€œCampbell.â€ Also Montoya is appropriating Andy Warholâ€™s famous use of Campbell Soup cans, and replacing the Scottish-American brand name with a Spanish brand name, which also happens to be the surname of the renowned artist Francisco Goya. Both artists play off of each other to show different types of irony in life. Whenever a viewer thinks they understand a work, there is new information that completely disproves the original concept. While Opalka poses these ironies in a more comforting and sincere manner, Montoya hits the viewer head on with slapstick, palpable humor. All in all, the experience is one of interaction. The viewers are forced into a world so similar to their own in theory, but so palpably unrealistic. It is a journey into the mind that really challenges the audience.